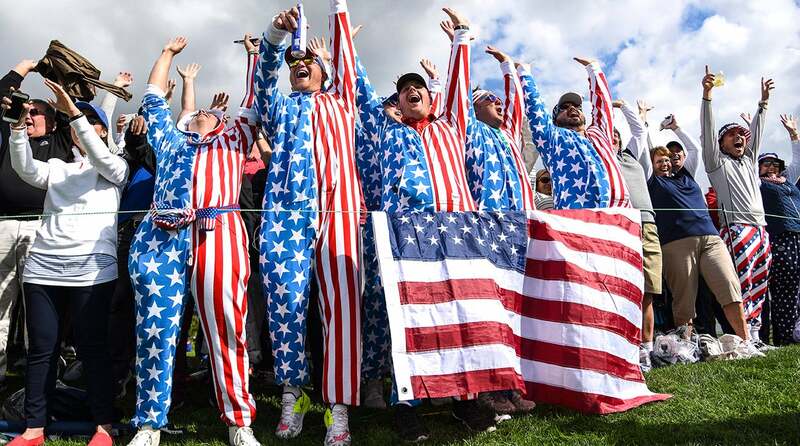 Tour Confidential: Are American golf fans out of control? 1. Marc Leishman's wife, Audrey, wrote a blog post criticizing American fans for the way they treated International players at the Presidents Cup. She said she was "thankful my boys weren't there to see the way people were treating their daddy." Rory McIlroy also had a fan kicked out at Hazeltine during last year's Ryder Cup (he probably deserved it for his expletive-filled rant), and Sergio Garcia called the way that same Ryder Cup crowd acted "quite poor." Do we have a problem here? John Wood, caddie for Matt Kuchar (@johnwould): Absolutely. I am working on an essay about this exact subject, and it's much too long to write here, but hopefully in the next few days it will be ready on GOLF.com. Stay tuned. Jeff Ritter, digital development editor, GOLF.com (@Jeff_Ritter): John, that was a masterful way to request a deadline extension on your essay! A seasoned journalist couldn't have done it any better. And I agree. It's not the majority, but a few knucklehead fans have popped up in the past two U.S. team events and had a negative impact. Gotta clean that up. I'm just not sure how. Sean Zak, associate editor, GOLF.com (@Sean_Zak): There's definitely a problem, but I'm not sure there's an easy solution. We want these team events to be fun, to be raucous and, more than anything, LOUD. So, we allow chanting on the first tee, players get into it; we allow the beer to flow and the celebrations to extend beyond the norm. I'm not saying it's right, but doesn't that make this result seem logical? Having one without the other seems a bit like fantasy land. Josh Sens, contributing writer, GOLF Magazine (@JoshSens): I think what we have is a confluence of a few things: the longstanding tribalism of sports (and the loud idiocy of some fans); the massive media attention that now helps stoke these international rivalries; and the increasingly coddled world of the professional athlete. Sure, there's a lot of irritating (and offensive) noise out there. But if these golfers think they are up against unruly public treatment, they might consider what, say, Charlie Sifford dealt with when he was trying to scratch his way onto Tour. Michael Bamberger, senior writer, Sports Illustrated: Davis Love has been talking about this lately in a more general way. Golf is a place to practice restraint. That tradition is part of what makes the game what it is. So many things in society are so loose. Golf needs to get back in touch with its own standards of decorum. Alan Shipnuck, senior writer, Sports Illustrated (@AlanShipnuck): The folks who run the Cups can't have it both ways—they market jingoism, plaster flags everywhere, have military flyovers and other rah-rah displays of force, bring in alcohol companies as sponsors...and then demand restraint from the fans? The overcooked atmosphere is what makes the Ryder Cup fun. (The Presidents Cup less so.) It's a bummer when fans lose control but what do the players (and organizers) expect? 2. Not long after dozens of pros went low at the Old Course in the final round of the Dunhill Links — including Ross Fisher's course-record 61 — Gary Player tweeted that it was "quite sad to see the Old Course of St. Andrews brought to her knees by today's ball & equipment." (This came just two days after Tommy Fleetwood set the Carnoustie Golf Links record with a 63 on Friday.) Is this scoring blitz on the R&A's home course likely to catch the attention of the governing bodies, or are we way beyond that point? Wood: Let me start by saying this: I love St. Andrews. An Open Championship at St. Andrews is as unique an event we ever get to participate in. It is special. That being said, without wind, with modern equipment, the Old Course doesn't have any defenses against today's pros. Without wind, and I mean strong winds, nearly every par-4 is a wedge second shot, and there are at least three driveable par-4s (some would argue there are five for the longest hitters), and the two par-5s are both reachable—the 5th hole with a mid or even a short iron. The question becomes does the R&A want to artificially toughen the course up with more pot bunkers so no one can hit drivers, or do they preserve the course as it is for historical reference and just pray for wind? Ever heard of Mavericks, a surf invitational off the coast of Half Moon Bay? It's a brutal big-wave surf break where they hold a one-day competition each year, and they give the competitors a range of dates. Only when the conditions are right do they announce the actual date of the competition. Maybe the R&A can do that. The Open will be held in July, and when the forecast is for 25 mph winds for four days, we will alert the competitors. Heck, I don't know the answer. Bamberger: We're looking at this the wrong way. I first played the Old Course in 1986. My goal then is the same as my goal now: play it with one ball, try to play better than bogey golf. For the super elites, par-5s don't exist anymore, but it really doesn't matter. We still all play a remarkably challenging and interesting cross-country game. Mavericks is great if you're one of the big-wave legends. (See: Barbarian Days, Finnegan, Wm.) But the Old Course is for any of us. Zak: It shouldn't take the Old Course being brought to its knees to catch the attention of the R&A. To hope that the same course challenges better, stronger athletes when they have better equipment is foolish. I'm not saying the R&A thinks that, but if this is the straw that breaks the camel's back, well, they're about four or five years too late on that realization. Ritter: We're way past the point where the governing bodies can be expected to step in and limit advances in equipment. It would help defend some of these classic courses, but it's not the only factor. Players today are stronger, eat and train smarter and play on courses that are immaculate. And last week at the Dunhill, the pros had calm winds and didn't play the extended "Open yardages." Add it all up and records were bound to fall. Fisher could've shot 59 on the Old Course on Sunday! Hey, there's always next year. Sens: This particular issue has been plain as day for a long time. Whether anything will be done is another matter. Our man Alan Shipuck has argued persuasively for longer courses. I would still rather see a limited-flight ball. Yes, I know that there are powerful interests that would oppose this. There are powerful interests that oppose many sensible things in our lives. It doesn't mean we shouldn't push for them anyway. 3. Rory McIlroy put a bow on his 2016-17 season with a final-round 72 at the Dunhill Links on Sunday. He finished four under for the tournament — 20 shots behind the winner — and tied for 63rd. It was just the second time in his professional career he was winless in a season. McIlroy, who has battled a rib injury and dropped to sixth in the World Ranking, said he won't start hitting balls until the end of November and in the meantime plans to work on getting his "body right." He's always been a streaky player, but do you expect 2018 to be a big bounce-back year for him? Wood: Yes. Now whether or not that includes major championship I have no idea. But he is too good and has way too much talent to go another year without multiple wins and great golf. Rory got married and divorced (from his caddie) and both of those are life- and career-changing events. He will figure all that out, be healthy, and be back to the Rory we all know next year. Zak: Sure, he could "bounce back," but I'm not even sure that would be impressive. The expectations we have for Rory are for him to win a major, to win multiple other events and for him to be a top-three golfer in the world. I'd need about a thousand words to explain why that's inherently difficult, but we were expecting a huge bounce back from him in 2016. Then we expected a major bounce back in 2017. We really didn't get either, but we still got "average Rory," which was him finishing in the top 10 in 43 percent of his Tour events, which is still great. Ritter: I want to believe, but I have no idea if he's healthy now, or if he can get there by next spring. Like Sean said, Rory still had a good year, he just didn't win. I don't think he becomes a consistent winner again until his body is right and he can put in max practice time. Sens: I'd be lying if I pretended to have access to any special crystal ball here. But since that kind of pretending is the bread and butter of online punditry, I'm not holding my breath. Rory is an epic talent, but he's now up against nagging injuries and short-game demons. To say nothing of an ever-growing swell of young studs. Those are daunting foes. Bamberger: One of the things I love about Rory is how remarkably open he is. He reveals himself in his play and in his comments as few others in the game do. I saw little and heard little this year that tells me he is as hungry as he once was. That's understandable and that's OK and that can change. But there's nothing to suggest to us when that might happen. Shipnuck: Eh, not so great. The fact is his play with the putter and wedges is miles behind the other top players. To be sure, injuries compromised his ability to practice and prepare this season, but his stats were poor in 2016 and middling in ‘15. Right now Rory is like a pitcher with a 105-mph fastball but no curve, change-up or slider. He has some serious weaknesses to address, but they transcend the physical. 4. Justin Thomas had a 2016-17 season to remember, winning fives times and claiming the FedEx Cup title. He'll defend the first of those five victories at next week's CIMB Classic, his first start of the season. While it might be hard to repeat a five-win campaign, we'll set the over/under on 2017-18 wins for Thomas at three. What side are you wagering on? Wood: With good health, I'll take the over and give you 2 1/2 wins. He's never lacked for confidence, which is a great thing, and now he KNOWS he's this good. It's not false bravado at all. I think he will show up every week expecting to win, and with that the only thing on your mind, things get very clear. Ritter: Thomas was awesome this year, but before Tiger reset the standards for what makes a great Tour season, a three-win year was pretty special. In fact, last year DJ and Jason Day led the Tour with three wins each. I think Thomas is here to stay, but I'll take under three titles in 2017-18. Zak: Let me start by saying a three-win over/under is an awful line! Two wins would be solid and four would make him a prime player of the year candidate...something like 2.5 wins is more fair. Anyway, his recent victories might lead us to forget just how much he was in contention this year. You could say the same for Jordan Spieth, too, but this could have very well been a seven-win season if Thomas wouldn't have buckled in Mexico or if Brooks Koepka doesn't take off with the U.S. Open. So, YES, gimme Thomas to win four times! Sens: At this point I'm more interested in seeing whether he can nab another major, which I believe he will. Shipnuck: Lol, Mike. The problem is baked into this question—Thomas is already teeing it up again! Dude needs three months off, not another start. I'll take the under, strictly because of burnout. 5. Thirty-seven days after releasing a video of himself chipping, on Saturday Tiger Woods tweeted a video of himself hitting full irons shots, but we still don't know when he'll return to golf competitively. What can/should we read into Tiger's decision to publish these home videos? Ritter: The Tiger News (note capitalization) with the most traction coming out of Presidents Cup week was Woods's final answer at a mid-week press conference, where he said he could envision a scenario where he never plays competitive golf again. I think Woods saw the headlines, didn't care for them, and wanted to remind everyone that he's going to give another comeback his best shot. I have no idea if he'll get there, but he's trying. Wood: I agree with Jeff. Walking a couple matches with Tiger last week at the Presidents Cup, it's amazing how much the fans want Tiger back. I guess it's not amazing, but everywhere he went, we all heard "We want you back, Tiger! Get back out here, Tiger!" So maybe that gets his juices flowing a bit and he wants those to know he's giving it his best shot. I think the world of Jordan, Rickie, Justin, Rory, Jason, etc., but add them all up and they don't move the needle like Tiger did when he was THAT Tiger. I would just love for all these guys who don't really know what it's like to play with THAT Tiger to experience it once. A Sunday with Tiger in the lead at Augusta. There's just nothing quite like it, and it would be good for them to go through it just once. Zak: I'll read into it! The guy is on the comeback trail. It's October, his event is coming up, 2018 is fully on everyone's mind as the season has officially started, he's feeling good, surgeon gives him the go-ahead, and it's time for a stripe show! Feel free to read that as optimism or sarcasm—either works—but he seriously seems bought into a comeback to golf. Now, what is your definition of a comeback? Sens: That he has excellent high-speed internet access. And that the old itch is still there. I suspect we will see him try to make a go of it at some point in 2018, even if only in his own charity event. Bamberger: What I read into it is Tiger's recognition that golf is among the most important things in his life, one of the main things that gives him purpose and stability and status, to say nothing of wealth. There are thousands of other people who could say the same. Shipnuck: I think it's about keeping his contracts in force. Deep down Tiger has to know that the magic is gone. But an injured athlete on the comeback trail can keep cashing checks; once you're officially retired a lot of those deals disappear. 6. Last week Pinehurst debuted The Cradle, a 789-yard nine-hole short course designed by Gil Hanse. Hanse, and Pinehurst staff, emphasized their newest invention is all about fun. In your mind, what's the most fun experience in the game? Ritter: Playing with family or friends as the sun slowly sets, with no group in front of you to hold you up, and no one behind you to hurry things along. Give me that setup and the venue is irrelevant. Wood: For me, it's playing with your buddies as a kid. No organized tournament or officials needed. Just you and your buddies, $2 on the line, and the thought that every last putt was to win the U.S. Open or the Masters. Zak: Gimme four friends of equal ability playing Wolf as the sun goes down, or give me 12 friends paired up in two-man scramble teams trying to make a few birdies before the beers set in. Each offers plenty of "aw shucks" shots, and plenty of room for aggressive competition. Sens: Playing a briskly paced round with good friends on any course with decent greens with a few dollars on the line. Bonus points if this happens first thing in the morning, with the fairways still dewy, or at twilight, with the shadows long enough that you have to watch where you stand. Bamberger: The single most-fun thing about golf is the sense of anticipation it gives its players. I once asked Billy Harmon, noted teacher and caddie, what he liked best about the game. He said, "The ball in the air." Shipnuck: That's such a good answer. The feeling of a purely struck shot is still as much of a thrill as ever; I've accepted that it won't always wind up where I want it to, but nothing beats that feeling. Except, perhaps, when you've hit a good putt and a foot or two from the hole you *know* it's going in. Nirvana.